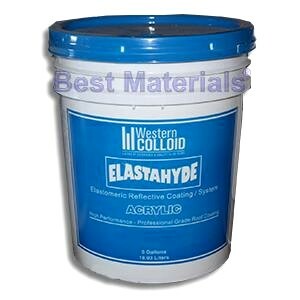 PRODUCT: WESTERN COLLOID #790 AFC, ELASTAHYDE WHITE ELASTOMERIC REFLECTIVE ACRYIC ROOF COATING FOR NEW FOAM ROOFS. 5-GALLON PAIL. PRICE/PAIL. Special Order: 2-week leadtime, 500 gallon min order. ElastaHyde 790 AFC reflects over 84% of Sun’s rays and serves as a thermal reflector due to hiding & reflective pigments. ElastaHyde 790 AFC can contribute to substantial energy savings. ElastaHyde 790 AFC is listed by the “Cool Roof Rating Council” and meets California Title 24 requirements. ElastaHyde 790 AFC is designed as a surface coating for Sprayed Polyurethane Foam, Western Colloid “Fluid Applied Reinforced Roofing” membranes and Western Colloid metal roof systems. ElastaHyde 790 AFC is also recommended for use on conventional and modified built-up roofs and single ply membrane roofs (with suitable primers). ElastaHyde is water based and not DOT regulated or restricted for air or highway transport. MIX WELL BEFORE USE WITH POWER MIXER. Substrates: Spray Foam Polyurethane Roofs, Recoating over All types of Acrylic Elastomeric Coatings, use on Conventional, modified built-up or metal roofing and more (with suitable primers as specified). PAINT TRAY, 22 INCHES WIDE X 3.6 INCHES DEEP X 14.5 LONG. BLACK COLOR, HEAVY DUTY / REUSEABLE PLASTIC TRAY ACCOMODATES ALL STANDARD 18 INCH WIDE PAINT ROLLERS. PRICE/EACH.